The Great Lakes of the USA and Canada include Lake Superior, Lake Michigan, Lake Huron (or Michigan–Huron), Lake Erie and Lake Ontario. These lakes form the largest groups of fresh-water lakes in the world. The other names for this group of lakes are Laurentian Great Lakes and the Great Lakes of North America. This series of interconnected lakes is connected to the Atlantic Ocean through St. Lawrence Seaway. The Great Lakes are a favourite when it comes to boating, fishing and other such recreational fun. Beaches of these lakes are as great as their collective name. For road trips, there are special roads that connect the Great Lakes. There is an option to either tour all the lakes in one road trip or go to an individual lake area. You can rent a car for this road trip on your American holiday. Lake Superior is the largest of the Great Lakes of North America and also the largest lake in the USA. Also, Lake Superior is the largest freshwater body on the earth. US shares the lake with Canada from one portion in the north. Lake Superior is one of the most-gorgeous places to visit in the US. The northern coastline of this cold lake is beautiful with tall cliffs, deep bays and a scanty population. The locals engage in fishing, hunting, timber-lands and tourism. This lake alone contains 10% of the world’s freshwater. The lake gives a look of a sea. There are many nice towns on the northern shores of the lake. Please, check the weather forecast before heading to or while planning your trip to Lake Superior. Lake Michigan is the only lake of the Great Lakes which is entirely in the US. The lake touches Chicago, Michigan City, Milwaukee, Grand Haven and many more cities. Lake Michigan is rich in Lake trout, Yellow perch, Bowfin, etc. The beautiful lake has many cruises and boat trips. Visiting the lake in the colder months is not the best idea. The lake got its name from Ojibwa Indian word mishigami, meaning large lake. Lake Michigan touches the states of Michigan, Wisconsin, Illinois and Indiana, while connecting to Lake Huron in the north. The second-largest Great Lake is Lake Huron, which is also a glacial lake. The typical activities of this area include fishing and lumbering. Lake Huron was the first one to be seen by the Europeans. The lake also holds the fifth position amongst the largest fresh-water lakes in the world and has the longest shoreline amongst the Great Lakes of the USA. Lake Huron has 30,000 islands; its Manitoulin Island being the largest freshwater island in the world. Lake Huron is a hub for the Ontario cottagers as the water of Huron is warm and the beaches are ideal for sand-play. In Michigan, Lake Huron is known as a ‘Shipwreck Alley’ as it has a record for more than a 1000 shipwrecks. Also, there are shipwreck tours available. Lake Erie is the fourth-largest of the Great Lakes of the USA; situated as a boundary between Canada and the USA (Michigan, Ohio, Pennsylvania, and New York). Erie is the fifth-largest lake in the USA and it has a beach for every kind of tourist. This lake is the shallowest, warmest and the most swimmable of the Great Lakes. Cities like Buffalo, New York; Erie, Pennsylvania; and Toledo and Cleveland, Ohio are in a close proximity to this lake. The literal meaning of Lake Ontario is “the lake of shining waters”. Ontario is the smallest and the easternmost lake out of the 5 Great Lakes of America. Yet Lake Ontario is the 14th largest lake in the world. This lake forms a source of drinking water to the population of Ontario and the New York State, comprising 9 million people. Lake Ontario’s watershed is home to the most number of Canadians. All of the 5 Great Lakes enter the Atlantic Ocean through Lake Ontario. One interesting thing about Lake Ontario is that it never freezes, because of its depth. Another interesting character of the lake is the “seiche” which results in back and forth movement of the water every 11 minutes. Ferries and water taxis are available for tours through the lake. Sailing, beach-combing and musical concerts are a few of the many activities you can do at the beautiful locations of Lake Ontario. 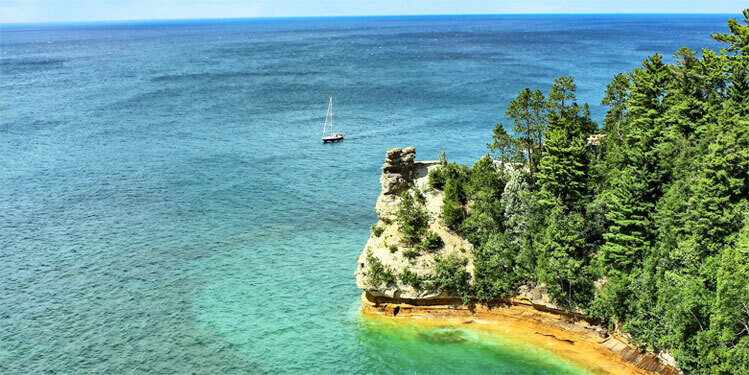 The Great Lakes make great road trips, you may rent a car and enjoy the natural beauty in the US.